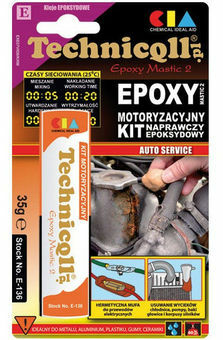 Motorization epoxy putty is an adhesive of the consistence of plasteline designed for quick car repairs (without dismounting). Bonds very strongly seals and fills losses. Resistant to vibrations, temperature and exploitative liquids. Life after mixing: 10 min. Preliminary hardening (25°C): 45 min.